British heavy metal legends SAXON will enter the studio in early 2015 to begin recording the follow-up to 2013's "Sacrifice" for a late summer release. "We're making the new album in January, February and March. 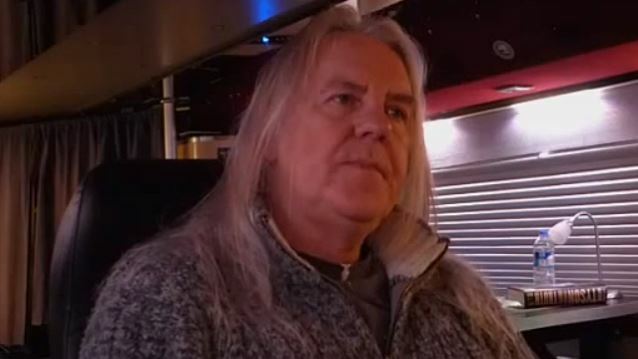 And then we go to America in May," SAXON vocalist Biff Byford told Rock Bottom during a recent interview (see video below). [The new CD will be released] maybe [in] August or September." Regarding how the new SAXON material is shaping up, Biff said: "I'm not gonna tell you, [but] it's heavy. There are some great classics, some melodic stuff on there as well." Asked how SAXON has found the time to work on new music while juggling a heavy tour schedule and spending time at home with their families, Biff said: "We've been writing in our time off. We haven't done a lot of this year, actually. It's very deceiving. We played a lot of festivals in Europe, but we haven't been really touring very much. We should have toured with MOTÖRHEAD in 2013, then we should have toured again in 2014, but it didn't work out. So we haven't really been touring. We've done quite a few festivals, so I think people's concept is that we've toured a lot, but we haven't." Byford also spoke about the pressures of coming up with songs that will be played on the radio and become hit singles. He said: "I think an album is a collection of songs that you write. I don't think we are interested in singles and things like that anymore. We don't have that pressure anymore writing a hit single, so we don't do that. If you have a hit single, it's by accident. It's hard to get it played on radio, because it's got guitar solos in it and heavy guitar stuff. They don't get played on the radio very much unless you're a young act." On April 29 via UDR Music, SAXON released "St. George's Day Sacrifice - Live In Manchester", a "hidden treasure" recorded live at The Ritz in Manchester, England during the band's "Sacrifice" world tour. SAXON's previous release, "Unplugged And Strung Up", contained 14 of the band's classic songs chosen for a makeover, thanks to some ear-catching new arrangements and mixes.